On January 20, 2018, an amateur astronomer by the name of Scott Tilley detected a signal he correctly deduced to have originated from NASA’s IMAGE satellite. This satellite, launched in early 2000, had fallen silent almost six years later and given up for dead. Interestingly, the mechanism for rebooting IMAGE involved passing through the shadow of a solar eclipse. While an eclipse in 2007 didn’t do the trick, speculation is that the eclipse I watched from Wyoming last summer may have done so. It’s nice to know the universe on occasion does make service calls! IMAGE, the Imager for Magnetopause-to-Aurora Global Exploration, was intended to spend its two-year operational life imaging charged particles in the plasmasphere that surrounds the Earth, using several new techniques. As such, it’s a tool to help us investigate the aurorae. Thanks to IMAGE, you can watch a beautiful timelapse presentation of an aurora over the South Pole here . While the science is important, our wonder at the exquisite and unexpected interactions between our planetary home and the rest of the universe is equally so. A sense of wonder about creation and the very human beings dwelling on – or near! – this Earth is why I write the stories I do. Artist’s conception of PicSat in orbit. Image courtesy PicSat. A couple of days ago, PicSat rocketed into orbit on a mission that will last about a year, thus neatly spanning this new year 2018. The mission will be to observe the transit of a gas giant exoplanet, Beta Pictoris b, as it passes between us and its sun. The planet is new in at least two senses: it was discovered in 2009, orbiting a star just 63 light-years from Earth, and it’s believed to have been formed quite recently. In fact, its orbit is actually inside the cloud of dust and debris left over from the birth of the planet. What makes this satellite special is its minuscule size and mass: PicSat isn’t much larger than a baguette. This comparison is particularly apt, because PicSat was designed and assembled in Paris. 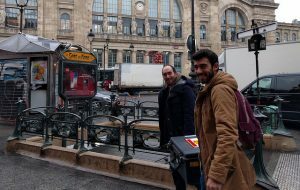 Here it is leaving Paris via the Gare du Nord, the Parisian train station dedicated to generally northbound departures. If you’re wondering where in the picture the satellite is, it’s in that picnic cooler-size container being carried by PicSat team members Sylvestre Lacour and Maturin Grénot. PicSat’s train ride to Holland was powered by an electric locomotive, by the way; electric locomotives were first introduced about a hundred and ten years ago—a nice illustration of the old and the new coexisting side by side. 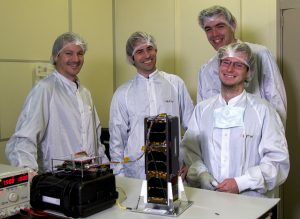 PicSat’s size, mass, and a few other properties were set by the CubeSat nanosatellite specifications which allow smaller packages to piggyback on launches of other, more complex and expensive payloads so long as they pose little or no risk of jeopardizing the host vehicle. As an example of this philosophy, once in orbit the host vehicle deploys CubeSat packages by means of a simple spring launcher—like a child’s toy. In a way, that’s precisely what they are: CubeSat specifications were originally developed to enable graduate students to design and build their own satellites. In railroad terms, this corresponds to a less-than-carload (“LCL”) shipment; while most people don’t know it, it’s still possible to ship small parcels in the baggage car on Amtrak trains today. Lately two female members of Congress have been in the news quite a bit in connection with the health care insurance debate. This takes us right back to where it all started, with Representative Jeanette Rankin of Montana, first woman elected to Congress. Neonatal and maternal health was one of Jeannette Rankin’s lifelong interests, and both during, between and after her two terms in Congress she campaigned tirelessly for better healthcare for women and children—so it’s particularly fitting that female officeholders have again made their voices heard across the land. Several western states (and some western Territories, even prior to statehood) very early granted women the right to fully participate in political life, including voting and holding office, so Representative Rankin’s position was anomalous: she was a member of Congress at a time when most US women weren’t even allowed to vote. She first came to prominence as a suffragette, and a powerfully persuasive one: she spearheaded the successful campaigns to allow women to vote in state elections in Washington (1910) and Montana (1914) before finally winning a seat in Montana’s Congressional delegation, where she continued to fight for universal suffrage (culminating in the 19th Amendment, ratified in 1920). 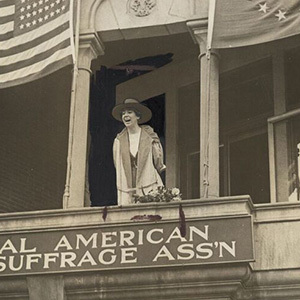 Jeannette Rankin is most famous for her resolute pacificism, but she herself disagreed with that popular idea: in her own mind, her pacifism arose from her radical feminist convictions. A few days after the November 8 election in the US, I found myself at El Pueblo De Los Angeles Historic Monument. This was after taking the Amtrak Sunset Limited train from Houston to L. A. and arriving very early on a cool, clear California morning. So we walked across the street from Union Station to see this park. The colorful vendors mostly weren’t open, but the buildings and works of art were there to tell of the history of Los Angeles. This spirited artwork caught my attention. 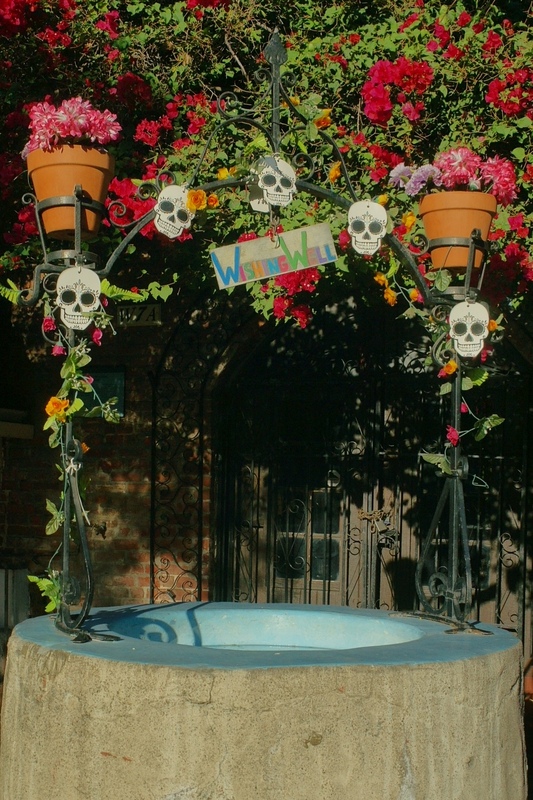 How amazing – this is Northern European and Mesoamerican pre-Christian imagery, wishing well and decorative skulls, intertwined just as these cultures are woven together in the Southwest. All kinds of public fountains can turn into penny-strewn wishing wells, but that likely dates back to tossing coins into sacred springs as offerings to deities that live there – water being a source of life and a sometimes scarce necessity. The Day of the Dead abounds in sweet sugar skulls and lively skeletons, but that comes from Aztec religion which took death very seriously and graphically – with the skull an image of hope. This decorated wishing well was an unforgettable reminder that our world has roots that are deep and dark and yet, though not optimistic, profoundly hopeful. Growing up I thought Columbus had to be the biggest small (-minded) city in the state of Georgia. Things have changed! Besides renewing the historic downtown and many other achievements, Columbus is working with Phenix City Alabama to create the world’s longest urban whitewater course. They’re taking out two old mill dams and giving the Chattahoochee River back its natural undammed flow, plus sculpting the rapids so as to attract paddlers ranging from the church-excursion level up to world class. Way to go! We love a holiday for which we can decorate our houses and doors, ourselves and our pets, and our workplaces. And ourselves at the workplace. Today at the Library the Reference Desk was being staffed by a librarian in a witch’s hat – a really good one with a curved brim and a floppy tip. Another great thing about Halloween is the opportunity for wordplay. Every store and online merchant that can work a pun into its ads has done so. (Terror-ific Deal! Unboo-lievable Savings!) Today’s Houston Chronicle contrived five (5) Halloween-themed headlines just on Page One: “Perry not spooked by slumping poll numbers,” “Texans scare up another victory,” “Mosquitoes engineered to kill their offspring,” “Hospitality begins at home. . . for the living,” about a local haunting, and “They go bite in the night” – a teaser for an article in the entertainment section about vampire bats. My favorite Halloween thing is the spiders. There are hosts of black-furred, purple-kneed, king-sized arachnids on the roofs and front doors of houses. One was clinging to the front of the hostess’s podium at Gaido’s Seafood Restaurant in Galveston this week; the hostess cheerfully introduced the giant black tarantula as Walter and told us he’s harmless. On campus this morning I stopped at a street to let a cyclist whizz by and admire her deely-bobbers. Bobbing above her head were four curled-up black spiders, each on a webby puff of white feathers. In real life spiders unnerve me. That may be why fake ones rather charm me. Especially when they have purple knees. Yesterday the Soaring Club of Houston couldn’t fly because of Temporary Flight Restrictions having to do with a wildfire to the east of the Field. The last time I remember it being clear, bright weekend weather when we couldn’t fly our sailplanes was the days after 9/11/01, when US aviation was grounded. It’s deja vu with the perspective of ten intervening years. Sunday’s Houston Chronicle Editorial pages include a column by Kathleen Parker in which she says, ” We stumble at last upon a purpose for columnists – to say that which no one else dares.” This in a column in which she posits that 9/11 caused America to go temporarily insane; that today’s political dysfunction took root in the soil of Ground Zero. Well, in observing the American mindset today, I’ve had to conclude that you can’t understand it without invoking psychopathology, or religion, and in particular, religion and psychopathology intersecting like a Venn diagram of doom. Earlier this week Thomas Friedman dared too. He said, “. . . rather than use 9/11 to summon us to nation-building at home, Bush used it as an excuse to party — to double down on a radical tax-cutting agenda for the rich that not only did not spur rising living standards for most Americans but has now left us with a huge ball and chain around our ankle. And later, rather than asking each of us to contribute something to the war, he outsourced it to one-half of one-percent of the American people. . . . We used the cold war to reach the moon and spawn new industries. We used 9/11 to create better body scanners and more T.S.A. agents. It will be remembered as one of the greatest lost opportunities of any presidency — ever.” The entire Friedman column is worthwhile reading. Flying canceled again today because of flight restrictions and a DC 10 observed to go right through our traffic pattern en route to drop fire retardant. Yay for the DC 10 – the fire looks more under control. The Soaring Club of Houston is breathing a sigh of relief and taking up a collection for our fire-struck neighbors. Our resident Piper Cub pilot took a neighbor who’s running a Facebook fire information page up for an aerial perspective which was appreciated. Meanwhile the Texas Renaissance Fair grounds have fire-fighting ops being staged while the Fair people get ready for opening day in less than a month; the Waller County Fairgrounds are housing all kinds of displaced livestock and pets, with some displaced owners living there too; and the news media report that a lot of the fire-fighting on the ground is being done by volunteers from all over. THE question for a soaring club on the weekend: are we flyin’? Is the weather OK and the tow plane in good repair? A week ago, I was at the Field to fly and answered a phone call from a member who lives in Lake Charles, Louisiana. “It’s pouring from the tropical storm here! Are we flying? Is the contest on?” Yes, yes, yes, even with winds of 15-20 mph from the north (thanks to that storm) we had a dozen gliders and sailplanes up in the air for training flights, local flights, and a contest with the other Houston soaring club. We even had a member test-flying his new self-launching sailplane. He was taking advantage of the strong wind straight down the runway, like how Orville and Wilbur did their first flights. It’s always easier to get an aircraft aloft with a strong headwind. Unfortunately, the winds from the north further dried out the parched vegetation in our region. Fires flared up and spread – like wildfire. The Riley Road fire is so close that half of our pattern is in the Temporary Flight Restrictions area. The club member who lives and hangars his power plane beside the Field was able to slip up into the air and see that the actively burning area isn’t moving our way. But this week was a nail-biter and the weather people say this colossal risk of fire may persist through the Fall. Today we are not flying – just hoping for the best. Texas wildfires are hitting too close to a lot of homes and too close to the homes of many hearts. Parks and schools have burned in addition to hundreds of houses. Now there’s a fire east of my soaring club. One of our members lives in a house adjacent to the Field and he’s been doing aerial reconnaissance with his Piper Cub. Today he says the Field (our field of dreams with thirty gliders and sailplanes, two tow planes, a nice new clubhouse, and a lot of equipment) will be OK provided the winds don’t shift the wrong way. Fire bomber airplanes have been hammering at the west edge of the fire. At present the Field is covered in smoke. May God forbid we should hear a Mayday to come to the Soaring Club of Houston and try to trailer out the sailplanes! Subscribe to my mailing list for an occasional newsletter, and by way of thanks you'll receive a free story in PDF.